“Yes indeed, you can make a fun and fancy treat without butter, eggs, milk or cream” recipe from our new Featured Foodies, Chrystal and Amir, with duodishes.com. Thanks, guys! Pour the apple cider vinegar into the milk and stir. Set aside to curdle. In one medium bowl, whisk the flour, cornstarch, cinnamon, baking powder, baking soda and salt together until incorporated. In another medium bowl, whisk oil, sugar, vanilla and citrus zest until smooth. Add curdled milk and combine. Stir dry ingredients into the wet ingredients until just combined. Pour into a paper-lined cupcake tin. Bake at 350 degrees for 18-22 min or until golden brown. Cool completely before frosting. Beat the cream cheese and vegan butter until smooth, scraping down the sides of the bowl to fully combine. Add two tablespoons of the powdered sugar, along with the vanilla and mix well. Add more powdered sugar half a tablespoon at a time until the consistency reaches a texture that you prefer for spreading or piping. 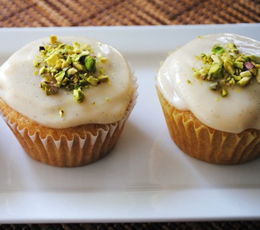 Spread frosting on your cupcakes and sprinkle pistachio pieces on top.